Pyle P2203ABTU. 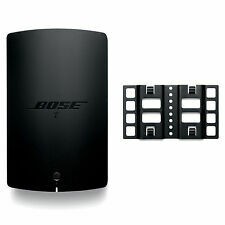 Built-in Bluetooth for Wireless Music Streaming. High-Powered Hybrid Preamplifier Receiver. 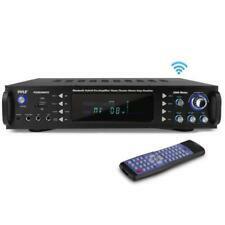 Bluetooth Wireless Range: 20 Ft. Bluetooth Connectivity Bluetooth Version: 2.1. AM/FM Radio with LCD Digital Display. This Phono Preamplifier adds phono capability to any amplifier or receiver that has a spare AUX/CD/DVD Audio line level input. Phono: 47k Ohms @ 200 pF (nominal). Crosstalk: 40 dB (phono), at any audio frequency. TEAC AI-301DA INTEGRATED AMPLIFIER/DAC. DAC Section. This integrated amp has been tested by Teac and is certified to be in perfect working order. 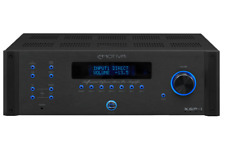 This great integrated-amp/DAC combines high-resolution audio with multiple sources including, analog, USB, Bluetooth®, plus digital coax and digital optical playback. It has been tested to perform all key functionality, with no discrepancies noted by the testing technician. We keep a smaller portion of each sale. Power Cord (built in). Relisting because of nonpayment For sale is a Rotel Stereo Tuner Pre amplifier Model RTC-850. This unit is used and in excellent cosmetic condition. I do not have the remote control for this unit. I plugged it in and it worked fine with no noticeable noise or distortion currently - But since it is a used piece of vintage electronics it is sold as is. Has a selectable MM/MC phono preamp I welcome any questions you may have. Winning bidder is responsible for shipping and handling. Audio 240w 2 Channel Stereo Amplifier AMP SPECIAL OFFER! 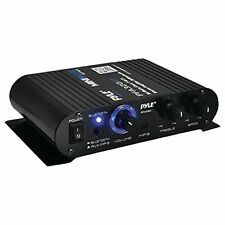 Pyle PCA4 Home Amplifier is perfect for powering any stereo system. Complete with 2 x 120 watts of power -- this simple to use and durable amp has bass and treble controls, a slick blue LED output level display, L/R RCA inputs, and 4 speaker outputs. Using sophisticated circuitry and premium components for uncompromising musicality -- this product is famous for delivering powerful and accurate sound. This small but powerful amp delivers clear and crisp audio for it listener. Durable and affordable, this amp is made to last. 2x120W at 4 Ohm Blue LED Output Level Display Power on LED Indicator 3.5mm Aux CD/MP3 Input Jack Treble and Bass Control Master Volume Control RCA L/R Input Four Push Type Speaker L/R Terminals 110/220 Voltage Selector Dimensions: 8.27''W x 2.72''H x 5. Includes the AC to AC adapter. Hafler DH-110 Preamplifier. Vintage Preamp. Many upgrades available online. "Hafler DH-110 Preamplifier. Discrete component design with no integrated circuits in the signal path. OPTIMUS SA-155 Integrated Stereo Amplifier. USED CONDITION/NORMAL WEAR.
' Features: ---Compact and Powerful Mini Amp System ---Built-in Bluetooth for Wireless Audio Streaming ---Compatible with All Your Favorite Bluetooth Devices ---(Works with iPhone, Android, Smartphone, iPad, Tablet, PC, etc.) ---1/4'' Microphone Input Connector Jack ---Aux (3.5mm) iPod/MP3 Input Connector Jack ---RCA (L/R)Audio Input Connector Jacks ---Four Push Type Speaker Terminals ---Rotary Treble, Bass, Master Volume Adjustable Controls ---Short Cut, Overload & Overheat Protection ---Source Input Selection ---Includes Power Adapter Bluetooth Connectivity: ---Instant Bluetooth Wireless Streaming Ability ---Works with All of Your Favorite Devices ---(iPhone, Android, Smartphone, iPad, Tablet, MP3 Player, etc.) ---Bluetooth Version: 4. This is a great stereo tube amplifier, uses EL34 output tubes for about 40W/channel. Made using very good parts, and sounds terrific. Bias adjustable on each tube. Sturdy steel and alloy chassis, painted red. Parasound V.3 2 Channel Pre-Amp/Processor Amplifier. Condition is Used but working perfectly. Couple scratches on the top. Shipped with USPS Priority Mail. Nobsound®——Dou​k Audio. Nobsound®——Douk Audio. HiFi Art-Elfidelity. Phono Pre-Amplifier. AUX function is tube buffer function to get thebetter warm sound, so you can setup T7 work for AUX or phono by input selector. Audio-Technica AT-PEQ3 Phono Preamplifier. Pre-owned Condition, tested working. Please see pictures as they are part of the description. For sale is a used Onkyo P-3300 pre-amplifier. Also all inputs were tested and found to be in great working condition. I couldn't find any specs on this model so do your research and look at the pictures for information. Hard Drive Capacity: 500 GB. Ethernet Technology: Gigabit Ethernet. Network & Communication. Wireless LAN: Yes. Wireless LAN Standard: IEEE 802.11b/g/n. Storage space is expandable via USB external hard drives.
' Features: ---High-Powered Hybrid Preamplifier Receiver ---Built-in Bluetooth for Wireless Music Streaming ---2.4Ghz Antenna for Extended Range ---Powers up to (4) Speakers ---AM/FM Radio with LCD Digital Display ---USB Flash Drive & SD Memory Card Readers ---MP3 Digital Audio File Support ---Connect & Stream Audio from External Devices ---Aux (3.5mm) Input Jack ---(2) 1/4’’ Microphone Inputs ---Headphone Jack, 1/4’’ ---RCA (L/R) Audio Connectors ---Screw-Type Speaker Terminal Binding Posts ---Volume, Subwoofer, Tone, Echo, Mic. Type of power amplifier: AV power amplifier. 1.5.0 speaker connections amplifier with radio. Adjustable mic echo delay effect. 1 x Amplifier. Bluetooth Vision:4.1. Bluetooth：Press until the word "BLUE" is displayed on the screen. Look at the pictures for more details. Features: Rack Mount Amplifier Receiver 2.1 Channel Audio Amp Design Bluetooth Wireless Audio Streaming Ability USB Flash & SD Memory Card Readers FM Radio with Digital LCD Display ID3 Tag Readout Displays Song Title Aux (3.5mm) Input Jack Connect & Stream Audio from External Devices Multi-Source RCA (L/R) Audio Input Connectors (2) 1/4’’ Microphone Inputs Spring-Loaded Speaker Terminals Combo Screw-Type Banana Plug Speaker Jacks RCA Subwoofer Output Front Panel Button Control Center Independent Input Source Selectable Bass, Treble, Balance, Source Volume Adjustable Includes Removable Rack Mount Brackets Bluetooth Connectivity: Built-in Wireless Music Streaming Receiver Compatible with All of Your Favorite Bluetooth Devices (iPhone, Androids, Smartphones, iPad, Tablets, etc.) Bluetooth Version: 2. Trending at $107.07eBay determines this price through a machine learned model of the product's sale prices within the last 90 days. Includes tubes and power cable. unused in the open box. I pulled it out of the box for the pictures. There are three digital inputs linked to a Wolfson ® 192 kHz/24-bit DAC, which allow you to exploit the potential of lossless formats such as WAV. However, it’s the sound quality that really puts this amplifier in a league of its own. Realistic SA-10 Stereo Amplifier - Excellent Condition! Has two sets of inputs: one labeled "Tape/Tuner", which is suitable for computer or phone/iPod with adapter, and one labeled "Phono" for turntables. I have used this as an amp for my Mac, as well as for my iPod. PARASOUND HCA 500 Amplifier. working great -. Enjoy stereo sound with your favorite pair of speakers and theCambridge Audio Topaz AM10 Stereo 70W Integrated Amplifier. Four stereo RCA inputs let you connect analog devices, and the MM/MC phono input enables connectivity with a variety of record players. It is in complete working order with minor wear. It is a wonderful backbone to a great audio set up. Output: 12V (Pre out Max). Total harmonic distortion: 0.02%. Schiit Magni 3 amp, only used for about a month and a half. I have since moved on to more expensive equipment. Works great, will ship in original box along with AC power cable. Nobsound®——Dou​k Audio. Nobsound®——Douk Audio. HiFi Art-Elfidelity. Audio HiFi & DIY. Bluetooth Audio Devices. Digital Interface / Sound Card. DAC / Audio Decoder. Digital Amplifier. With myriad features available in the MC-12, the simple and intuitive user interface provides ultimate adjustability without being confusing. Access to the listening modes, input and output settings, speaker distances and levels is never more than a few button pushes away. Bryston cubed series is the latest and greatest masterpiece. Great peace of mind and excellent resale value due to such long warranty period. NILES Audio SI-275 High-current stereo amplifier Great- Free Shipping. Condition is Used. Shipped with USPS Parcel Select Ground. Musical Fidelity M6i - Dual Mono Integrated Amplifier, Excellent Condition! The M6i is essentially identical to the newer M6si model. I have for sale my Musical Fidelity M6i Dual-Mono Integrated Amplifier. This is an integrated amplifier with multiple inputs/outputs/by-pass/and USB input. This item is the Yamaha MX-S90 "natural sound" 2 channel stereo power amplifier made in the early 90's. It's rated at 140 watts total (70 w/channel @ 6 ohms and 170W max. total.) It is fully functional. It has a nice champagne brushed aluminum face that is nearly flawless. There are a few scuff marks on top...please see pics. It can be placed in a bookcase due to it's compact 11x4x12 size. For sale: A Primaluna Prologue Four Power Amplifier in mint condition. Included in the sale is the complete factory original Primaluna tube set consisting of four EL 34 power tubes and two each of 12ax7 and 12au7 front end tubes. Bozak Madisson CLK-PH8 Phono Preamplifier. DIN in/outputs also provided. CLK-PH8 Phono Preamp. DIN in/outputs. dual-mono circuitry for optimal channel separation. gain: 32dB. Wireless Music Streaming. Turn any speakers into a wireless zone. If your item has already left the warehouse, we cannot match any reduced pricing. Price Match Policy. Must have a valid working phone number for all orders.